The Melt jam included a tease of In-A-Gadda-Da-Vida. Reba included a Pop Goes the Weasel tease and did not contain the whistling ending. Weekapaug was unfinished. Mike and Fish teased Maze in the Digital Delay Loop Jam. This show was officially released as Niagara Falls. This show was part of the "1995 Fall Tour"
Solid show! This is my favorite of the three Mike's -> Weekapaug's. Just real dirty, the noise jam in the last half of Weekapaug is super awesome. Reba is ridiculously fast, yet still fairly clean considering, and has a great build. It's a bummer that they didn't all catch the cue to end it, though. It just kind of sputters out. This isn't my favorite Split of '95, but it is hard to dislike this level of balls-out energy, even though it kind of wanders a bit. The Possum and Slave, especially the Slave, in the first set are great too. Hmmm, this review is turning out kind of backwards, oh well. Also, the planned segue between The Curtain and AC/DC Bag works really well, I love that stretch. Typical Fall '95 goodies to all around! The NFCC felt more like an airport hanger. It was a huge open space with cement floors and ceiling like a gymnasium. The stage was set up on one end and there was a set of bleachers on the other end. It felt really empty because it was so large. A group of about fifteen of us from Rochester, NY, hung out only a few feet from the left side of the stage. It was a pleasure to have so much room to dance so close to the stage, a rarity at the time. Although I thoroughly enjoyed the show at the time, I enjoy it even more with repeated listenings to my audience tape. The show opens with a misplaced "My Old Home Place" getting things off to a mellow beginning. I love the lyrics of this song. A rare "Curtain", typically itself an opener, follows and segues directly into "AC/DC Bag"! The first jam of the night had us all grooving. This one is a classic with a well-developed jam. An unusual pairing of "Demand" and "Rift" felt odd, but was soon topped by a mid-set "Slave to the Traffic Light". This was a huge surprise and a great treat. It felt like the perfect song for the atmosphere inside the venue. The second set opens with a raging "Split Open and Melt", possibly to complete the continuity of "Demand". It's full of energy as they push the jam beyond its limits, and then end it in a rather mellow fashion. "Julius" features Page's colorful piano set against Trey's sharp rhythms. The "Mike's Song" is a little unusual because it is unfinished. The band opts against the trampolines, and Trey immediately begins a solo. About halfway through the jam, Trey begins playing his small drum kit, something he was doing frequently in '95. 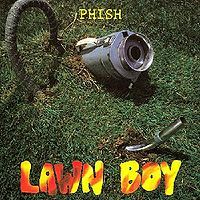 Mike then switches the bass line to a somewhat funky sound, reminiscent of a Phil Lesh solo in the '73 - œ74 era. The band ends up never playing the composed reprise section of "Mike's Song" that is usually followed by the sandwich song such as "Simple" or "I Am Hydrogen". When Trey settles back on guitar, he begins to tease Van Morrisons' "Gloria". 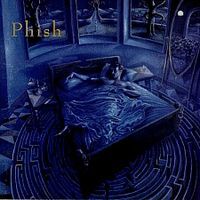 A very clear "Gloria" jam develops, a song that had been played six months earlier on 5/16/95. As the jam continues, it suddenly becomes very familiar. In a moment of haze I realized it was "Weekapaug Groove". The band locked up and dropped the musical scale into the opening riff of the song. This is a very nice "Weekapaug" with a great solo from Trey. 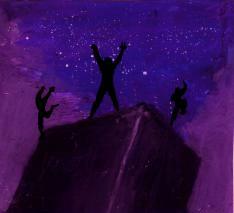 As the song enters the reprise section, something unusual happened: no one sang anything. It soon sounded like the band was going to play "Maze". We were excited! Instead, something weird happened. The look on the band members' faces told me something was wrong. Eventually Trey stopped playing guitar, but Fishman and Page were still playing. He then waved his hand across his throat, giving the universal cut sign, put down his guitar, and walked to the front of the stage. It was an odd moment, and a real buzz kill. Mike soon joined Trey up front, but you could feel and see the tension as Fishman and Page remained at their instruments. I'll never forget watching their facial expressions during this apparent argument. Eventually they gave in and sang "Amazing Grace". The band came back and encored with a short "Uncle Pen". Although I love this tune, it seemed really strange since it's a song with no jam and has no real musical conversation. This was a little disappointing at the time after being teased with a potential monster show-closing "Maze". This bump in the road does not detract from the rest of the enjoyment. Get a copy and take a listen! 1st show and what a show it was. An above average show from an above average tour. The boys jump right into hose mode with a slick curtain and a smoking Acdc bag. A sparkling mid set slave remains my personal favorite of all time. The 2nd set opens with another favorite split that really gets creepy. Great stuff! The rest of set is rather ho-hum until a monster mikes appears. Nearly 20 minutes in length this one rips and segues directly into weekapaug. Interesting to say the least. 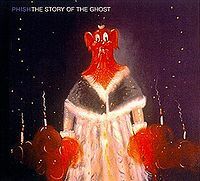 Give this one a listen to phish at their finest. 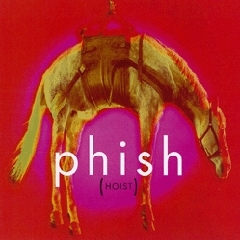 Well I am reviewing the awesome discs Phish has put out the past few years, and this '95 gem is up next! Old Home Place is a peppy opener. You can tell just how tight and fast they could play during this period. Curtain>Bag is a classic pairing, like a fine wine and cheese plate. Demand is fun, hey I caught this one in the year 2016! Rift is awesome, these early mid 90s versions are clinical. Slave to the Traffic light is the first step out of ordinary in the middle of the first set. Wild placement and boy what a version. Trey kicks on the Leslie speaker and that beautiful watery peak flows through. This one is a keeper! Peak! Guyute follows up in fine fashion. Bouncin' cools it down a bit before a SCORCHING Possum. That's right! Hello My Baby is it's acapella self. Set II kicks off with the audience chess move - a nice snapshot of a moment in time. Melt is the opener and this baby is monstrous. So darn evil. A favorite version when I look for evil snarling pulsing jamming. Strange Design is a nice cleanser. Taste in its infancy is ok.
Reba throttles to 11 out of the gate and the jam is really beautiful. It's not the cleanest version, but it's fast and contains some inspired full band improv. I really like the peak and sustaining notes. Julius is atypical for having the Page solo - so its worth a spin. Sleeping Monkey > Sparkle brings the laughs before we get serious. Mikes is awesome. They kick into a great jam and Trey eventually moves to the kit, making good use of it actually. Great rhythmic segment. They get melodic and Trey leads us to a glorious repetitive riff, which resolves in absolute perfection -> Weekapaug. The Groove is awesome and this one shreds. Lots of intensity and great peaks with an awesome DDL Jam. Overall, one damn fine Mike's Groove. Nothing in the middle but straight up jamming! Amazing Grace and Uncle Pen send us home. Overall 5/5 and another great release. A real showcase, great song list and a '95 Mike's, Reba, Slave & Melt are what that year was all about!!! It may just be because I slept overnight in between listening to Sets I and II of this show, but I find this one sort of exhausting. The sheer energy and virtuosity on display in 1995 (and Fall 1995, in particular) can tend towards that. This is also a typically stacked setlist for the time. Highlights include Demand, Slave to the Traffic Light, Possum, Reba, and Mike's Song -> Weekapaug Groove (with Digital Delay Loop Jam/general Type-II weirdness to end it.) The Split Open and Melt is pretty atonal(?) and harder to listen to, making this--as @waxbanks mentioned in his review--a "noob-unfriendly show." 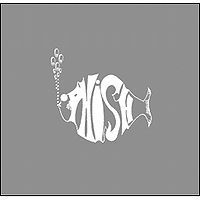 If you are new to Phish, though, and maybe have only heard shows from 2009-2017, you should really do yourself a favor and hear the laser-guided precision of Fall 1995. Great show! still had that small venue feel even though Phish was starting to play big venues.. I do remember hanging in the back before the second set and right about in the middle of Melt, the guards must have broke up a fight with tear gas... the back of the venue started getting foggy and people started choking.. Pretty weird! only show i've ever been to that that happened! It cleared after 5 or 10 mins but was a shocker! Luckily the building was long enough that most people didnt get bothered by it.. Made it very memorable though!